SHORT BOX TRUCKS: When choosing the right fifth wheel hitch there are a few points to consider, but to start and perhaps the most important is the length of your box because SHORT BOX TRUCKS will require a 5th wheel hitch with a slider. LONG BOX TRUCKS: If you have a LONG BOX TRUCK, a sliding 5th wheel hitch is not required since there's enough clearance between the hitch and the cab of your truck to make a turn while towing. 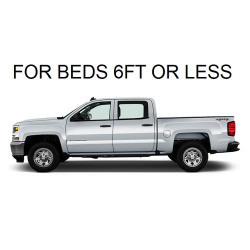 5.5FT BOX TRUCKS: Special consideration is required when towing with a 5.5ft BED TRUCK. 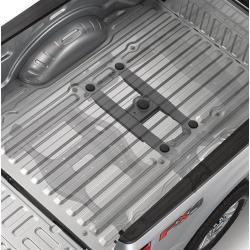 There are a few models with sliders that will enable you to make a turn with a 5.5ft bed. Given the length of the box, it provides little clearance between the cab of the truck and the 5th wheel you're towing, and unless you've got the right 5th wheel hitch, your 5th wheel trailer will very likely make contact with the cab of your truck. SHORT BOX WITHOUT A SLIDING 5TH WHEEL HITCH. Notice how the trailer makes contact with the cab window. SHORT BOX WITH A SLIDING 5TH WHEEL HITCH. Notice how the head of the 5th wheel sits closer to the tailgate during a turn, this position provides the added clearance needed between the trailer and cab to make the turn to avoid any contact. 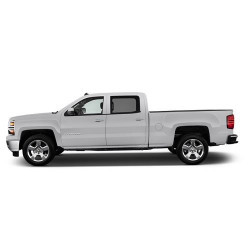 ORIGINAL EQUIPMENT (OE): You may have a truck with a factory prep package, in which case you'll need to purchase a 5th wheel hitch with legs that are compatible with your factory towing system. AUTO OR MANUAL SLIDER: If you have a short bed truck, and looking for a 5th wheel hitch with a slider, then it's worth noting not all 5th wheel hitches with sliders or rollers are auto-sliding. MANUAL sliders are very common and they require you to get out of your truck and engage the slider to allow for more clearance to make the turn, then once the turn is complete, you must set the 5th wheel back in its towing position and lock it in so it cannot slide while towing. This sort of arrangement is very practical, economical but a little less convenient than the auto sliding hitches as they engage the sliding mechanism as needed, and automatically. TOWING CAPACITY: Your required towing capacity is very important. Towing limitations are imposed by the lesser of your towing vehicle, and your 5th wheel hitch. To know the required towing capacity, you must consider the weight of your 5th wheel trailer once loaded. SINGLE & DOUBLE PIVOT: The 5th wheel head takes much of the impact of bumps & road irregulations when you're not driving your 5th wheel trailer down the road. To absorb the impact of this movement, all 5th wheel hitches have a degree of front to back pivot movement, some also have side to side movement. BRAND: Lastly, just like you may be a Dodge, Chevy, or Ford kinda person, some prefer certain towing brands over others. The good news is we have them all, including B&W, Curt, Reese, Pullrite and Hijacker. WHAT IS A DOUBLE JAW 5TH WHEEL SYSTEM? DOES MY DODGE HAVE OVERLOAD SPRINGS? 5TH WHEEL ON CHEVROLET AVALANCHE? HOW TO HOOK UP A 5TH WHEEL HITCH?